Steve Ramirez was talking about Friday’s Glendora-Chino Hills boys basketball game, and said that Dominic Tiger-Cortes was the best pure shooter he’s seen since Glendora’s Tracy Murray. It got us talking about the best team in Tribune history, which starts with the best player ever, and that goes to Tracy Murray. He averaged 44 points his senior season (2nd all-time in CIF-SS) and became the CIF-SS and state single-season scoring leader, finishing with 1,505 points in 1989. Murray averaged 32 points in his career (3rd all-time in CIF-SS), and scored 3,053 career points (3rd all-time in CIF-SS). He was the Division II player of the year in 1989. 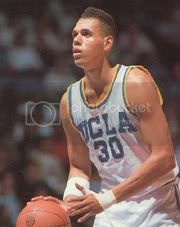 He also starred at UCLA and had a modest NBA career. Mike Smith, Los Altos, 1983 (Maybe the best athlete of all. Not only was he one of the best basketball players ever, but he was also one of the best quarterbacks. He had a stellar career at BYU). Scott Williams, Wilson, 1986 (Was the 3-A player of the year in ’86 and played with Michael Jordan on three NBA championship teams). Keith Van Horn, Diamond Bar, 1992 (He was great in high school and got better in college. He was a three-time WAC player of the year at Utah and all-time leading scorer with 2,542 points. He also had the best pro career of anyone on this list). Casey Jacobsen, Glendora, 1999 (The CIF-SS all-time scoring leader with 3,284 points, and only two-time All-CIF player of the year. He had a good career at Stanford and was a journeyman in the NBA). Above: West Covina High’s Armando Anaya in a December tournament game against Ayala. 2-1 win over Nogales proves record is legitimate. Always one of the area’s top ten best. But will they hang with MView in MVL? Off to a great 3-0 start in Montview, and facing Duarte and Azusa this week. Not sure if this record is complete, but will be heard of in Miramonte, that’s for sure. Playing well at the moment, already 1-0-1 in San Antonio. Above: Walnut’s Veronica Ramos battling with South Hills players. Complete team all the way around. Should have beaten Glendora, but settled for 2-2 tie. Defense is solid, just needs more scoring opporunities. South Hills won’t sneak up on them again, Mustangs beat Huskies 3-1 last week. After great December, Lancers are 0-2 in Del Rey. Mission Valley not the strongest, but Knights doing their part. Where does Dominic Tiger-Cortes rank among the Glendora greats? How will the Conq’s hold up in a league with Bonita and Dranch? Some nights they’re great, some nights they aren’t. Solid from top to bottom. Good inside and outside play. Can it take the next big step and hang with Diamond Ranch? Starting to hit its stride, and licking their chops to avenge loss to rival Aztecs. Okay, so they’re 1-1 in the Sierra. I have confirmed that Bishop Amat’s 6-foot-6 sophomore center Jordan Salley, who was averaging 12 points and 10 boards for the Lancers, left the school last week and has enrolled at La Verne Lutheran. I’ve seen this kid play twice and he’s the real deal. Great hands, footwork, nice touch. He’s already special and should blossom when he begins playing again, which in all likelihood will be next season on an already young and talented team at Lutheran that is 12-0. For Bishop Amat this is a huge loss. Since building their new basketball facility they’ve enjoyed great success from the girls team, but have yet to get the boys program moving in the same direction. South Hills High School standout Dorian Wells has given a verbal commitment to attend Villanova University, and will sign his national letter of intent when the signing period begins in early February. Huskies linebacker Kebin Umodo also made his decision known over the weekend, giving a verbal commitment to Air Force Academy. The first day players can sign national letters of intent is on February 6. It doesn’t look like a huge list this year. Bishop Amat’s Dominique Austin (DL) is committed to Arizona, and semi-local Kevan Walker (WR) of Arcadia is headed to UCLA. This is a good thread to discuss where other area players are thinking of going or have already verballed. Monday Night Showdown in girls Hoops, Bishop Amat (14-3) at St. Paul (11-5), 5:30 p.m.
Is it time to worry about the Bishop Amat girls basketball team after losing to Magnolia, 44-27, on Saturday. I know Magnolia is good at 13-4, but scoring only 27 points? It looks like a fifth-straight state finals appearance is in serious jeopardy. And with reigning player of the year Kristen McCarthy graduating and heading to Temple next fall, what’s the future of the greatest show in the San Gabriel Valley?